The Hurt Locker (2008) is a feature film about the experiences of a US Army Explosive Ordinance Disposal (EOD) team stationed in Iraq aft er the US invasion there. Based on the experiences of scriptwriter, Mark Boal, who was an embedded journalist with the US military forces in Iraq in 2004, the film has been widely praised as a gritty, no-holds-barred war film and won six US Academy Award in 2009, including Best Picture, Best Original Screenplay (for Boal), and Best Director. 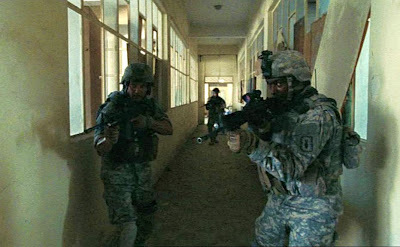 The film begins in Baghdad, where the Bravo Company is in the final weeks of their tour of duty (“rotation”). We are immediately introduced to the three-man EOD team of young soldiers that must undertake the extremely dangerous tasks of disarming and removing improvised explosive devices (IEDs) that have been set up by insurgents. The team comprises an expert IED deactivator, who must wear a heavy, cumbersome bombsuit that provides partial protection, plus two backup soldiers who guard the back of the explosives expert. 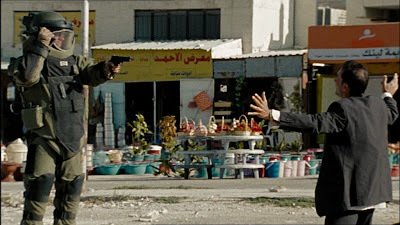 Almost immediately the leader of the team is killed by a radio-controlled IED, and he is replaced by another expert who continues to work with the other two men. The rest of the film follows events in the remaining, harrowing six weeks of this group’s rotation. I have mixed feelings about the The Hurt Locker, because it has significant strengths and weaknesses, and depending on your tastes, your enjoyment of the film may vary. First consider the film’s strengths, which are the basis of the film’s great popularity. By the way, the film does not take a position about the justification for the Iraq War, the American involvement in the Middle East, terrorism, or other issues that are constantly discussed in this connection. The film is solely about the American soldiers, and everythin g is seen from their point of view. 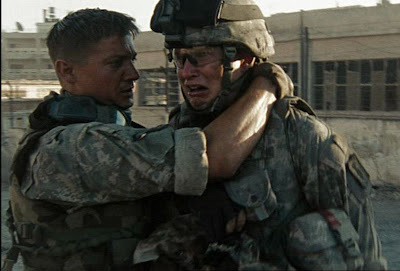 In fact when it comes down to it in my view, The Hurt Locker is not a war film at all, but is a horror film. It doesn’t really show ordinary military combat, and there don’t seem to be military objectives to be gained or lost. 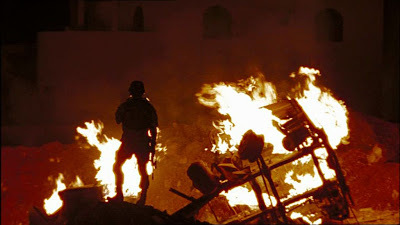 Instead, the EOD team seems to be entirely isolated from a battle front and placed in some kind of special hell. Despite the expanse of the city, there is a feeling of confinement, even one of claustrophobia throughout the film. Truly this EOD team is, psychologically at least, perpetually locked in the “hurt locker”. Cinematically, the film is reminiscent of Ridley Scott’s classic horror film, Alien (1979), where the protagonists are threatened by an amorphous enemy force of unknown powers that is always just out of sight and is difficult even to identify. The powers possessed by the EOD team seem incredibly flimsy in comparison with the powers of the threats they face. Their flaky little robot vehicle loses a wheel and becomes dysfunctional when it merely runs over a small rock in the streets. How pathetic their supposedly advanced technology appears to be in this threatening theater of action! Their heavy, cumbersome bombsuits makes the bomb deactivators swelter in the heat, prevents them from moving well, and, as we see in the opening sequence when the first bomb expert is killed, doesn’t even seem to provide much protection. The other two backup solders in the unit seem to be isolated from any other support and so are overwhelmingly outnumbered by the crowd of onlookers which could harbor any number of potentially lethally equipped enemies. The cinematography and editing are geared to accentuate this incessant feeling of paranoia. Handheld, point-of-view camera shots constantly give one the feeling that one is part of the OED team, peering around corners and looking through window openings to catch sight of the next danger. Director Kathryn Bigelow often used four simultaneous camera setups to shoot a scene and wound up giving her editing team (who did a great job with both the visuals and the sound) 200 hours of footage to work with in order to achieve this sustained nightmare of anxiety. Further contributing to the feeling of impending doom is the abrupt manner in which some sympathetic characters are annihilated. On two occasions we are introduced to characters in the story that are performed by well-known actors who are customarily placed in protagonist roles (Guy Pearce and Ralph Fiennes). We naturally and unconsciously expect these characters to provide some heroic leadership for our benighted EDO team, since a film production wouldn’t normally be expected to waste such a performer on a minor role. Yet our hopes are quashed; both characters are easily obliterated in short order by the unseen evil. This, again, brings to mind certain events in Alien. There were other past films that came to mind as I watched The Hurt Locker, and perhaps Bigelow, an MFA graduate in film criticism from Columbia University, had them in mind, too. The incessant, chaotic “fog of war” in the film reminded me of the classic The Red and the White (1968) by Miklos Jancso. The depressing return at the end of the film to the very hell from which the main character had managed to escape was reminiscent of the final scene of Andrzej Wajda’s Kanal (1957). And Bigelow won accolades for her efforts that put her in the rank of those directors: the US Academy Award for Best Director, the Directors Guild of America Award for Outstanding Directing, the BAFTA Award for Best Direction, and the Critics' Choice Award for Best Director. But despite the admitted strengths of the atmospheric cinematography, there are some significant weakness that prevent it from being an outstanding film. The film narrative is episodic and fails to progress towards any kind of goal. This is where it dims in comparison to Scott’s Alien , which had a relentless progression of enclosure – the continual closing off of avenues of escape and the successive elimination of hoped-for support for the endangered protagonist, Ripley. The handheld camera shots do offer subjectivity, but often the camera is much too shaky. This is a common mistake of inexperienced cinematographers, who apparently want to suggest agitation and also provide a “newsreel” sense of reality. In fact, this only calls attention to the camera work as camera work and tends to distance the viewer from the action depicted, thereby subverting the very sense of immediacy that was desired. The character development in the film is weak. Although the acting is good, the characters have strange, unmotivated swings in fortitude and attitude. In particular, Sergeant William James, who emerges as the principal character, seems to be utterly fearless, but he remains opaque throughout. What really motivates him? As a consequence, it is difficult to empathize with his situation. For example, at one point in the film when the EOD team comes across a bomb factory, James is highly disturbed to discover the dead body of an Arab boy, who earlier used to hawk DVDs on the street and was known to all the soldiers as “Beckham”. We are led to believe that James had some sort of personal relationship with Bechkam and some feeling for the brutal sacrifice of this boy. But later on, James encounters Beckham on the street (evidently his earlier identification of the dead boy as Beckham was erroneous) and shows no reaction. Why? You would at least expect that James would have been surprised by the site of the living boy whose presumed death had so agitated him earlier. The film opens with a quotation from Chris Hedges’s book, War is a Force that Gives Meaning: "The rush of battle is a potent and often lethal addiction, for war is a drug”, with an emphasis on the idea that war is a drug. At the end of the film, James returns to the United States to rejoin his wife and child, but is evidently bored. So he returns to Iraq to serve another tour of duty to satisfy his apparent craving for another rush. This is a very weak conclusion, and it undermines, enervates, and trivializes everything that has come before. (This also has a quite different meaning from the fatalistic return to the underground “hell” in Kanal.) 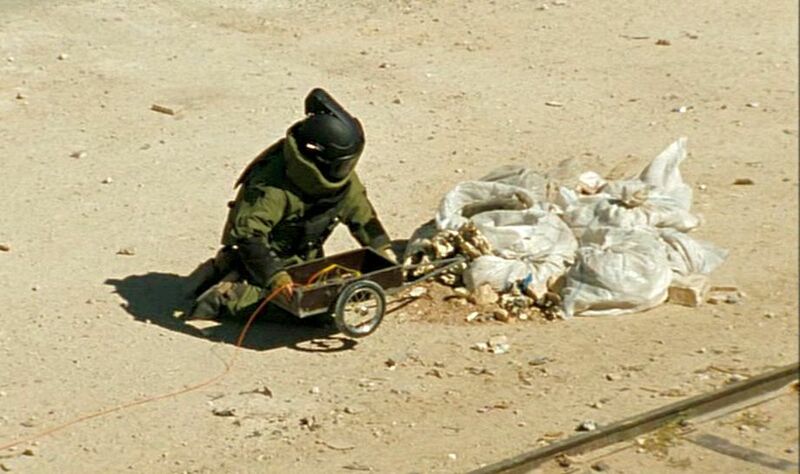 The idea in The Hurt Locker that the civilian “real world” is just too complicated for some soldiers, who prefer simple, black-and-white tasks that have clear outcomes has been asserted many times before, but it is a weak assertion and it doesn’t apply w ell to the murky, paranoid conditions of this EOD unit. Anyway, the proper metaphor in this respect is not so much drugs as it is sports. Sports and games are what offer the rush that comes from a dramatic victory in connection with a contest with a straightforward goal. So after all that horror, are we to emerge from the cinema with the conclusion that the whole thing we have watched is, for many soldiers, just a game, just a thrill, just a drug rush? I don’t know, but I doubt many soldiers feel that way. So what we have is a film with a brilliant atmosphere but with a seriously flawed narrative. 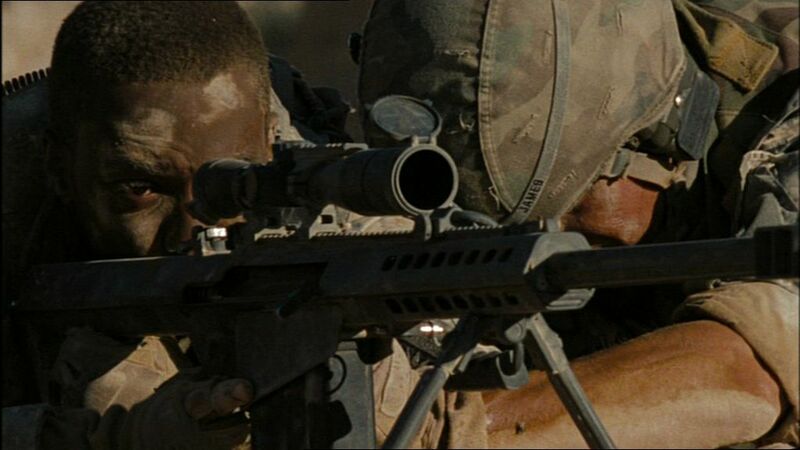 The Hurt Locker is at times gripping, but it does not carry through with a compelling narrative and so is not what it could have been. This is just one reason why Scott's Alien is vastly superior to its sequel, Aliens (1986), directed by Bigelow's ex-husband, James Cameron.